If you’re living with credit card debt then you’re not alone. According to a recent study, every 8 in 10 Americans are living in some form of debt. In many ways it’s crucial to have debt to be able to afford crucial things in your life, such as your home and car. Credit card debt, on the other hand, serves very little purpose and is often considered “bad debt,” as it doesn’t help improve your quality of life like student loans or a business loan would be able to. The Debt Elimination Calculator is here to help you slowly work off your debt in an efficient and healthy manner. Best of all, the template is absolutely free; just download the file below to begin eliminating your debt. After downloading the free template, simply start in the top section and start filling out the required details of your debt. This information will include things like the debt amount, interest rate, and the minimum payments they have set for you. After you have filled out the above information, the template will automatically get to work and give you an accurate account of your debt and the time it will take you to pay it off. If you’re not satisfied with the amount of interest you’ll end up paying or the amount of time it will take to pay everything off, you can keep adjusting the above figures to figure out a monthly payment plan that you’re comfortable with that’s affordable. Keep in mind that paying the minimum amount on your credit card is not the best idea. Not only will it take longer to pay off but you will also end up spending more in interest and hurt your credit score. 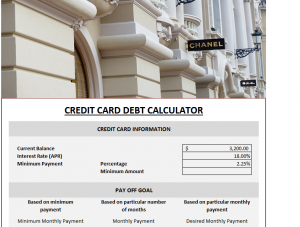 The purpose of this template is to give you a fast and convenient way to calculate a monthly payment plan that works for your financial situation.